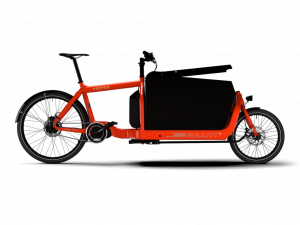 Kangaroo Lite is the new, chic cargo bike from Winther. The user friendly design delivers everything you need so it quickly becomes an important part of your family’s everyday life. The children enjoy being transported around in a safe and comfortable way. The children are safely strapped to the uniquely designed child seats with five-point harnesses. Here is plenty of room for children up to 120 cm. The entrance is low making it is easy for the children themselves to get in and out of the cabin. This saves the adult for many lifts. Behind the seats there is a spacious room for luggage. The cabin cover has a panoramic window so you can easily see the kids while cycling. The front of the cabin can open as well as the rear end of the hood for comfortable ventilation. Side windows are there but cannot be opened. It is possible to add a sun shade, insect net and more. The strong alu bars holding the hood provide extra protection over the children’s heads. The bottom compartment is formed in the shock-absorbing ABS plastic easy to decorate, for example with stickers and the like. Fun for the children to make it their own. Kangaroo lite is equipped with reflectors at the front end and along the hood making it highly visible in traffic – also at night time. It is prepared for lights. Kangaroo Lite comes with a steering damper in one position which makes the bike stable and comfortable to ride. Seven internal Shimano gear with coaster brake on the rear wheels and disc brakes on the front wheels as standard means breaking safely, regardless of weather. The saddle post is equipped with a quick release making it easy to find the optimal riding position. The frame construction is lightweight and strong. Rear frame is made of aluminum while the front frame is made of rigid resistant steel. and comes with cover, hydraulic disc brakes on the front wheels, puncture resistant Schwalbe tires and 7 gear Shimano nexus as standard. The hood is available in red, black, gray and blue. The frame comes in red, black, silver, blue and white. All colors can be combined as desired. E-solution is also an option. 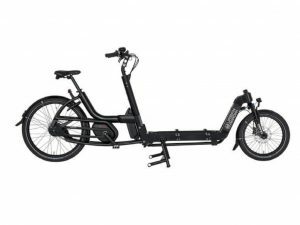 We recommend this if you live in a hilly area, carry a heavy load or just prefer to get there faster. See more about our e-solution here. Cabin dimensions Length: 86 cm, width: 71,5 cm, head height from cabin seat to hood: 64,5 cm.